A short story of mine is coming at you soon from Epic Rites Press: I’m included in the upcoming Punk Chapbook Series, a collection of short works by fourteen authors, available only by subscription. For your subscription money, you get a chapbook each from favorites of mine like Lawrence Gladeview, Misti Rainwater-Lites, Rob Plath…actually, you should just go check the page to see the whole list of writers. They’re all excellent. 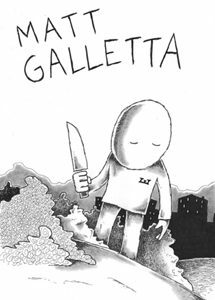 Plus, each chapbook features cover art by the talented/demented Janne Karlsson. See the cover for mine to the right. My entry in the series is a single short story called “The Stuff Dreams Are Made Of” that’s a bit…different. You can read more about the series and subscribe at the Epic Rites/Tree Killer Ink site. I might add, ahem, that Epic Rites is the same publisher that will soon be putting out that poetry collection of mine I might have mentioned a few too many times already. Why not order both?